Here comes the ultimate XTREM BOT, Trooper Bot. Here comes the ultimate XTREM BOT, Trooper Bot. 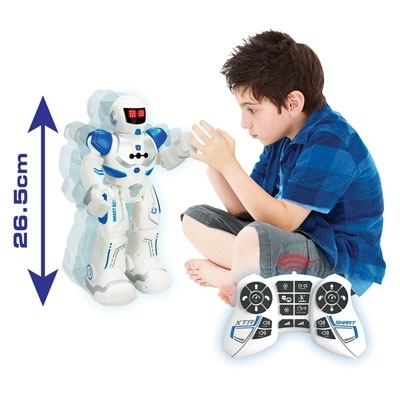 Over 35cm tall, the high tech Trooper Bot is armed and ready for combat, with a missile launcher built into its arm – take aim and fire using the infrared remote control. Then when the battle is over, Trooper Bot can perform its own robotic dance! Trooper Bot can walk and slide forward, turn, move backwards, and follow up to 50 consecutive commands. The multi LED eyes have a variety of facial expressions. 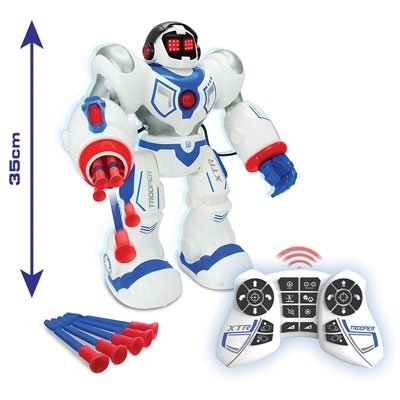 Trooper BOT comes with a protective visor, 5 missile darts and USB cable for recharging (2 x AA batteries only required for the controller). For ages 5 years and up. The R.C Robot last generation. 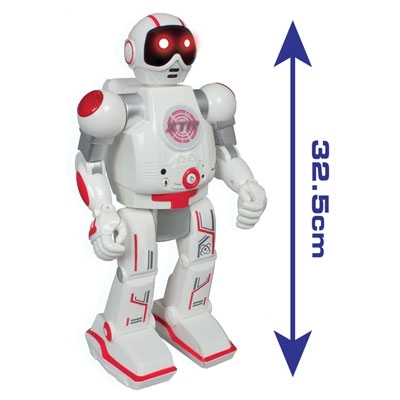 Direct it by command, point gun and shoot projectiles, 3 shooting modes, 50 programmable actions, 2 speeds, facial expression, 35 cm tall. Rechargeable battery via USB.